NetGalley description--The popular writer, blogger, and television personality reveals with humor and style how Jesus' extravagant grace is the key to dealing with life's biggest challenge: people. The majority of our joys, struggles, thrills, and heartbreaks relate to people, beginning first with ourselves and then the people we came from, married, birthed, live by, live for, go to church with, don't like, don't understand, fear, struggle with, compare ourselves to, and judge. People are the best and worst thing about the human life. Jen Hatmaker knows this all too well, and so she reveals how to practice kindness, grace, truthfulness, vision, and love to ourselves and those around us. By doing this, For the Love leads our generation to reimagine Jesus' grace as a way of life, and it does it in a funny yet profound manner that Christian readers will love. Along the way, Hatmaker shows readers how to reclaim their prophetic voices and become Good News again to a hurting, polarized world. You guys, I’m not even sure what to say about For the Love. 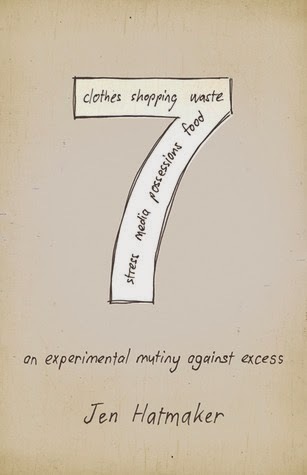 I read listened to 7: An Experimental Mutiny Against Excess several months ago and loved it. Everything from the message to the voice to the audio narrator was inviting. When I saw that Jen Hatmaker had a new book coming out, I jumped on it. I hesitate when requesting religious books for review because while I do read these type of books regularly, I don’t read them frequently enough or fast enough to really feel good about being able to review them by the release date. However, For the Love’s release date was so far in advance from when I requested it and the book so short (only right at 200 pages) that I thought I could make it work. Little did I know that I would read this one just as quickly as a fiction book. That just doesn’t happen to me very often. After reading several books recently that either felt irreverent as a whole or at least partially irreverent I felt like I needed a good dose of some reaffirming religious content. Jen Hatmaker seemed like a good bet. The first twenty to thirty percent of For the Love had me highlighting large sections of text a time, emailing them to my friend Kay (the one who suggested I read 7 to begin with), and generally laughing out loud. This lady is hilarious. And on point. Only Jen Hatmaker could write an entire chapter dedicated to “Leggings are not pants” and “Tights are not leggings.” But there were serious subjects too, about the pressure we put on ourselves to be not a jack of all trades but a master of all trades—especially in the mom category. Even being an expected mother, I can totally see myself already placing these burdensome standards on myself that she discusses. Plus the first section of “thank you notes” in the style of Jimmy Fallon were also hilarious. I found myself nodding my head and “amening” throughout almost all of the first half of this book. And then we get to the second half of the book. I won’t say the book took on a more serious tone as there were some rather serious topics discussed in the first half of the book, but I guess the humor was dialed back a notch with this second half. Perhaps that’s because this section was about how to deal with yourself. The remaining sections of the book were about dealing with people who live in your house, friends, neighbors, strangers, enemies, church, church people, not-church people, and God. It’s easy to laugh at ourselves I guess, but throw other people into the mix and waters can get muddy. 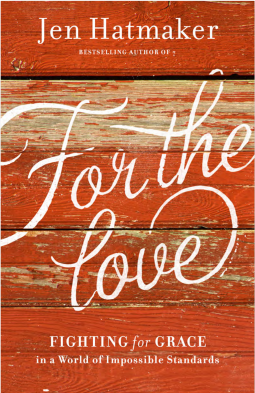 For the Love still had plenty toward the second half of the book that had me nodding my head and amening. It gave me some good ideas on things I’d like to try when dealing with others and some things to think about. But I also found myself annoyed and confused about a few things. There were a few references to the gay community which is a huge topic in our culture today, but mostly I came away from that subject unsure about Jen Hatmaker’s thoughts or convictions on the subject. I feel like she addressed this in the way that she did on purpose. It wasn’t the purpose of this book to discuss this subject in detail, but I wasn’t sure what the message was that she was trying to relay about this either. I was also unclear about her thoughts/definition of the church. This feels like semantics because there’s the biblical definition of the word “church”, what it means, and what all is entailed in it, and then there’s the 21st century American definition of the word. Why the difference matters isn’t always clear to everyone, but it does. And in the end, I wasn’t sure whether Jen Hatmaker was using the word in the biblical way or in the American 21st century way. Sometimes I felt one way and then others times I felt the opposite. One last complaint is that while it’s apparent that Jen Hatmaker is familiar with the Bible and what it says, For the Love was a little full of shoulds and shouldn’ts with very little actual Scripture used. Let me clarify, I don’t think this book was meant to be some big instructional manual (which I actually liked). It ended up feeling like a bunch of thoughts and realizations that Jen Hatmaker has had throughout her life. Conclusions that she’s come to. Etc. At times, the overall message of For the Love felt like it was missing and some of the chapters felt disconnected. When I got finished I had to stop and really think back over the book to see if I could even recognize a common theme. It wasn’t really until I went back to the table of contents while writing this review that some of it made sense. I don’t know if that’s one of those “pregnancy brain” things that I’ve struggled with or if the lack of cohesion was an actual issue in execution. -Folks who thrive in God’s grace give grace easily, but the self-critical person becomes others-critical. -We need to quit trying to be awesome and instead be wise. -There’s a difference between humility and insecurity, and self-effacement does no one any favors. -How many trot out that tired cliché—“I’m waiting for God to open a door”—and He’s all, “I love you, but get going, Pumpkin,” because usually chasing the dream in your heart looks surprisingly like work. -A good parent prepares the child for the path, not the path for the child. -I worry we consider “success” to be a product of the parent’s diligence more than the child’s. -Lean honestly into every hard place, each tender spot, because truthfulness hurts for a minute, but silence is the kill shot. -Married tongues should be shredded with the amount of ugly words bitten back. -Loneliness can be a prison, but we have keys. You needn’t wait for someone to open the bars. -You can’t pour antidote into poison forever and expect it to transform into something safe, something healthy. In the end, For the Love is definitely a book that I enjoyed and got something out of. I enjoyed the first section the most. And while I find myself wanting to recommend this book to others, I also want to advise caution. I always direct readers to the Bible itself for any “how tos” or “should/shouldn’ts”. If there’s anything you read in For the Love that you just aren’t sure about, the best thing is to bounce what it says against what the Bible says. The Bible always win. The parts that had me laughing out loud made me want to give this book 4 Stars, but the parts that left me confused or concerned knocked that rating down to 3.5 Stars. Have you read For the Love? What did you think? Let me know! This review was first published at Somewhere Only We Know. 2013 BrightlySalted.com. Powered by Blogger.